Students whose abstracts are accepted for an oral presentation or poster presentation are eligible to submit a paper for consideration for a student award. Please be sure to indicate “yes” on the registration form above if you plan to make a submission for a student paper award. Papers received by March 11, 2019 will be given full consideration. Jerome Kaplan Award for best graduate student paper, honoring Dr. Kaplan’s more than 50 years as a major leader in gerontology at the local, state, national, and international levels. 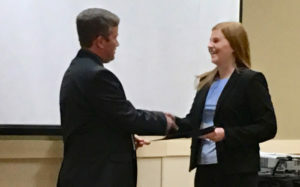 The Arnedia Smith Award for best undergraduate student paper, honoring Professor Smith’s work at Edison State Community College, her strong dedication to gerontology education, and her leadership in the former Ohio Network of Educational Consultants in Aging. (ONECA). Manuscripts must align with the student’s conference presentation, and may be created specifically for the conference or be a modification of current work such as a class project, paper, thesis, or dissertation. The submission should not exceed 25 pages (not counting references and tables) and follow APA format (e.g., double-spaced, 12-point font, and 1-inch margins). Submit the manuscript via email to Dr. Amy Roberts, OAGE Awards Committee at rober128@miamioh.edu. It is also highly recommended that students who provide a submission for the award ask a mentor or faculty adviser to send an email to Dr. Roberts to explain why the submitted manuscript merits consideration for the award. For over 50 years, Dr. Kaplan was a major leader in gerontology at the local, state, national and international levels. Arnedia Smith was a Professor of Sociology at Edison State Community College for 13 years. She died after a brief illness at age 40. She was an original member, Ohio Network of Educational Consultants in the Field of Aging. This award was created to remember this well liked and well respected educator with a strong dedication to gerontology education. She was very prominent in promoting the development & advancement of gerontology programs throughout the region and state and co-chaired ONECA Annual Conference. Arnedia was involved with professional workshops designed to assist educators and service providers in the field of aging.